Here’s an interesting one on Regal. 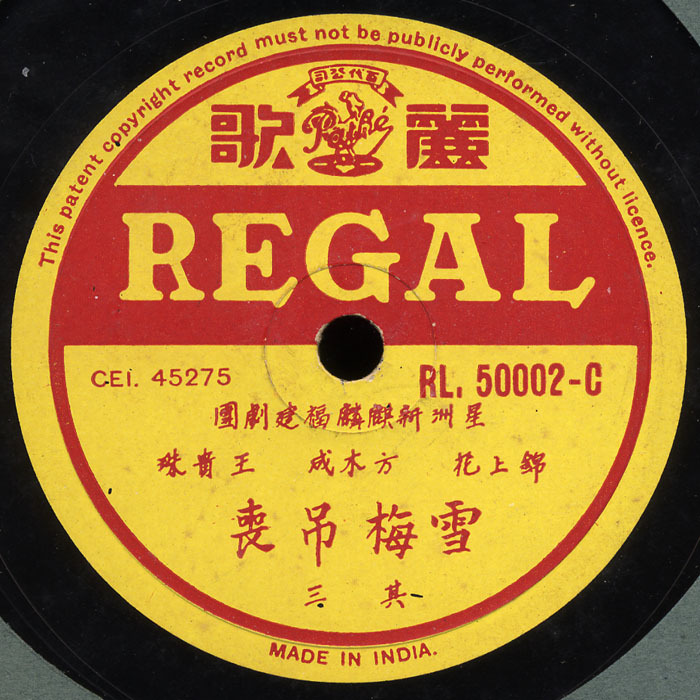 Chinese opera was usually released in the form of a 2, 3 or 4 record series to accommodate the lengthy lyrics. The music tends to be very similar on each side of these series, often with subtle variations or key shifts. Such is the case with this 2 record series, of which this is the third part. The first three sides are almost musically identical except part 3 introduces some amazing sliding and tremolo. Not only is this effect not on the other songs in this series, I’ve never heard it on any other Chinese record! I’m not too sure about the history of Regal, but it’s obviously a subsidiary of Pathe at the time of this release. Hi Dave! This one is wonderful. And I was wondering when the rest of the four part series on the singer Bai Ju Rong will appear? Eager to hear more of him, he is amazing. Thanks again and keep it coming! great, thanks for the correction! Really appreciated the Amoy opera, whne i was a kid i enjoy those opera shows,it’s wonderful..please put out more<if U have more< for us to listen!